Teardrops n Tiny Travel Trailers • View topic - Different grades of aluminum? 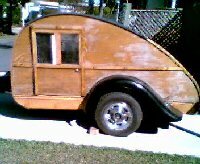 I want aluminum top and sides for my teardrop. What thickness should I use? Does it matter what grade I use? Will any of these work? Should I just go with whatever grade is cheapest? I won't bore you with a lecture on metallurgy, but here's a good site: http://www.ez.org/aluminum.htm. I'm using 5052 H32 and definitely would avoid the 6000 and 7000 series. They are much harder alloys and are more difficult to work with. In fact, our robots use 6061 T6 for the chassis and 7075 for the track frames - and they are built to crawl the walls inside power plant boilers. I'll second Corey on the 5052-H32. It will give you good corrosion resistance on those nasty Michigan winter roads! .032" or .040" if you are backing it up with plywood on the roof. Thicker, if you're not. I used whatever was alailable. When you start talking about 5ft wide rolls, you have to take what you can get. Thanks for the quick reply. That's really useful to know. I am going to build a 5' wide and might have to take what I can get, but that gives me a good starting point. good link Coreyjhen. I knew there had to be a method to all those numbers.